Cortés Malinche & Montezuma López de Gómara, Francisco. Historia, di Don Ferdinando Cortes, marchese della Valle, capitano varlorosissimo. In Venetia: per Giouanni Bonadio, 1564. 8vo. , 354 of 356 ff. (lacking fol. 1 and final blank).  Following the achievement of the conquest of Mexico, Cortés did not know how to stop and rest on his laurels: He sought greater fame and honor and to do this embarked on several ill-conceived expeditions that added no luster to his name, and when it became clear that the king was not going to make him a viceroy, the slide down the slope was an unpleasant one. Still striving, he enlisted his chaplain Francisco López de Gómara to write a history of the New World that would include a laudatory biography. The Historia general de las Indias (first published in 1552) is divided into two parts which stand on their own although clearly written as two parts of a whole. Part I is a history of events concerning the discovery and conquests of the New World exclusive of those involving Cortés. Part II is entirely dedicated to the telling of Cortés's role in the conquest of Mexico and subsequent discoveries. In this Italian translation from the pen of Agostino di Cravaliz, López's “all-Cortés” volume stands as part III of the three-volume Historia, delle nuove Indie Occidentali, with parts I and II being translations of Cieza de Leon's Historia, over Cronica del gran regno del Peru and the previously mentioned part I of Gómara's Historia general de las Indias. The text here is printed in italic type except the capitals, which are roman. 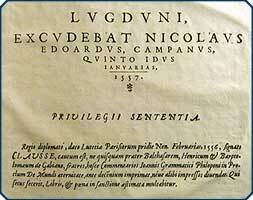 The title-page is printed in roman and italic and has the woodcut printer's device. Cortés Historia in Italian — Signed American, PROVIDENCE Red Morocco Lopez de Gomara, Francisco. Historia, di Don Ferdinando Cortes, marchese della Valle, capitano varlorosissimo. Venetia: Per Francesco Lorenzini da Turino, MDLX . 8vo (15 cm; 5.75"). [11 of 12], 348 ff. (lacks the title-leaf).  In this Italian translation from the pen of Agostino di Cravaliz (first published with title Historia di Mexico, et quando si discoperse la nuoua Hispagna [Roma: appresso Valerio & Luigi Dirici fratelli, M.D.L.V]), López's “all-Cortés” volume stands as part III of the three-volume Historia, delle nuove Indie Occidentali, with parts I and II being translations of Cieza de Leon's Historia, over Cronica del gran regno del Peru and the previously mentioned part I of Gómara's Historia general de las Indias. The text here is printed in italic type except the capitals, which are roman. Leaves 292–96 contain a brief study of Nahuatl and include lists of numbers, months, days, and years in that language. Binding: American signed binding by Coombs of Providence, R.I., for John Carter Brown (ca. 1865), with his binder's ticket. Full red morocco, round spine, raised bands; author, title, place and date of publication in gilt on spine; gilt roll on board edges; gilt inner dentelles. All edges gilt. Gilt supra-libros of John Carter Brown on front cover. Provenance: Ownership stamp of John Carter Brown on first leaf of preliminaries, supra-libros as above. On his death to his son John Nicholas Brown (1861–1900). On his death deeded to the John Carter Brown Library. Deaccessioned 2008. A BALLI-Printed Broadside  A Mexican INCUNABLE Notarial form. Carta de poder. [Mexico: Pedro Balli, before 14 September 1590]. Folio. f.
Click the images above for enlargements.  Uncommon first edition of this translation: Neoplatonic philosophy, translated by Joannes Mahotius into Latin from the original Greek. Philoponus (ca. 490–570 a.d. ), also known as John of Alexandria or John the Grammarian, was an opponent of Aristotelian physics; the present item defends the tenets of Christian creationism against the arguments of Proclus, an Athenian Neoplatonist and Philoponus’s mentor. Renaissance HUMANIST Study of Church History Platina, Bartolomeo. Bap. Platinae, cremonensis, opus de vitis ac gestis summorum pontificum. Coloniae: Apud Maternum Cholinum, 1562. Folio (29.1 cm, 11.5"). ff., 385 pp. [i.e., 399],  p.; 98 pp.,  ff.  First Panvinio edition of Platina's Lives of the Popes and six other works. Panvinio (1530–68), a great Augustinian scholar, annotated and updated the papal history to 1560. Bartolomeo Platina (born Sacchi, 1421–81) was a leading member of the humanist community at Rome and Vatican librarian, acclaimed as the author of the first printed cookbook, De honesta voluptate. His Lives of the Popes, which originally appeared in 1475 under the title Liber de vita Christi ac omnium pontificum, went through numerous editions and was for quite some time the standard papal history, despite its often critical assessment of the Roman Pontiffs. The text is in Latin printed in roman and italic, divided into sections for each pope and the additional treatises: De falso & vero bono, dialogi; Contra amores; De vera nobilitate; De optimo cive; Panegyricus in bessarionem doctissimum patriarcham Constantinopolitanum; and Oratio ad Paulum II . . . de bello Turcis inferendo. Woodcut initials in criblé, historiated, and floriated styles decorate the text, which is enhanced by side- and shouldernotes. Two large sections list the popes in chronological order, charting relevant dates with notes. The printer's device, incorporating Psalm 64:12 (Vulgate numbering), adorns the title- and final page. Renaissance Humanist Study of Church History (2) Platina, Bartolomeo. Historia B. Platinae de vitis pontificum romanorum. Coloniae: Apud Maternum Cholinum, 1568. Folio (32.5 cm, 12.75"). , 454 [i.e., 464], , 469–565 [i.e., 535], , 98, , [32 (index)], 28, 31, , 144 [i.e., 146] pp. (pagination erratic).  This is the third edition of the version of this prepared by the great Augustinian scholar Onofrio Panvinio, and it incorporates the first edition of Panvinio's Chronicon ecclesiasticum (see above). The text is ornamented with woodcut initials and occasional head- and tailpieces. Panvinio's De ritu sepeliendi mortuos, De stationibus urbis Romae, and Chronicon ecclesiasticum are appended at the back (as issued), and have separate title-pages and pagination.